It all started when a co-tutor on the CELTA suggested that I borrow some mini-white boards for an input session on boardwork. My trainees had so much fun drawing pictures of varying degrees of artistic proficiency to convey meaning of the words ‘prawn’, ‘chess’ and ‘aubergine’ while I was also able to provide a much more hands-on practice session of organizing collocations, using mindmaps, and marking phonological features. I decided then to invest in my own set of mini-whiteboards and they have been a hit in the staffroom since. I now use it for both teacher training, English teaching and even exam preparation classes. 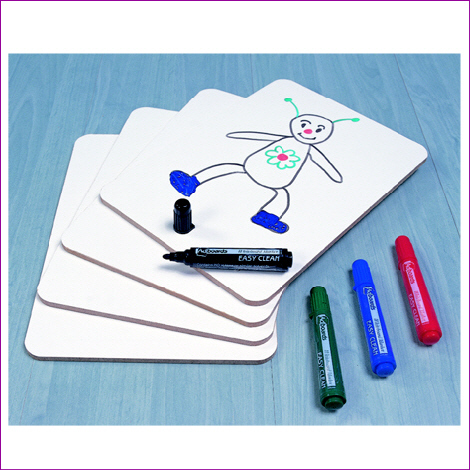 See here for some cheap mini-whiteboards you can purchase for your classroom. A mini-whiteboard can be given to each student, or to a pair. As a variation to back-to-board, I explain the lexical item in the context it was encountered, and students write their answers on the white boards. If this is to be done competitively in pairs, students should be given a few extra seconds to discuss their answers…On the count of three, they turn their boards over to reveal their answers. This way you can check how much they remember of the lexical item and their spelling of it. Instead of using tedious needs-analysis forms, students can write (or as a creative alternative, you can get students to draw) their goals on the boards. Holding their goals up for the whole class to see is step 1 to materializing those goals, and is a good chance to see if their classmates share the same expectations. I sometimes write up a whole list of topics e.g. Health, Food, Education, Politics and Current Affairs, Travel, Family and Relationships, Technology, etc… (or Business skills if you are a BE teacher, e.g Presenting, Chairing Meetings, Taking part in meetings, Negotiating, etc.) and students vote for the topics they want. Depending on the size of the class, each student/pair might get anything from 2 to 4 votes. They write their favourite topics on the mini-whiteboards, and when all boards are turned round, the teacher can have a clearer idea as to which topics are more favoured than others. A variation of this is to write up the four language systems (grammar, lexis, pronunciation, discourse) and four language skills (reading, writing, speaking, listening) up on the board and students vote for which language system or skills they think are most important and they need most work in. Whether done as a lead-in to a lesson so as to activate the relevant schema and lexis, or as a first stage to process writing, the boards seem to be a good platform for groups of students to draw their mind-maps. Learners seem to take more ownership of their work when it is put on the mini-white boards and shown to the rest of the class. An empty board can look much sadder than an empty notebook page, and you will notice that students are often much more keen to fill up that mini-whiteboard. An idea I adapted from the ever-so adventurous and creative Fiona James, this is a variation on Jigsaw Reading. Students are given different texts to read and asked to make notes so that they can retell what they have just read to the other students. However, here’s the catch. They can’t write any words. All notes have to be in the form of pictures that they will draw on the mini-white boards. This automatically forces students to process the texts for meaning instead of simply copying out chunks of words, and it also encourages students to use their own words and paraphrase what they have read when retelling it to their partners. You know the drill. After a freer speaking exercise and feedback on content, the teacher writes up a list of sentences/words she has heard students say and puts students in pairs to correct those sentences on their own. The idea is to get students cognitively involved in the reformulation/correction process instead of simply telling them what their mistakes are. However, what sometimes happens with some students is that they would skim through the list with their partners, making minimal effort and waiting to be told the ‘answer’. I now give each pair of students a mini-whiteboard each and systematically go through the list of sentences one by one, and with each one, giving students time to discuss with their partner and write the reformulated sentence on the mini-whiteboard. On the count of three, they turn their boards over and I shower praise on those who have thought of good or creative reformulations. The competitive element somehow ensures that everyone is on the toes. 6. What are the collocates? To be used in conjunction with a corpus, the teacher gives students a lexical word e.g. global, boost, community, or even a de-lexicalised verb e.g. get, make, set, and students are given a time limit to write the top 5 (or 10) most frequent collocates of the word on their white-boards. You might want to limit the part of speech e.g. top 10 noun collocates, or top 10 adjective collocates, so as to prevent articles and prepositions from appearing. A variation of this activity is What are the prefixes/suffixes? Also a corpus-based activity, using the * key, find out the top suffixes and prefixes of words such as ‘like’ or ‘organise’ by typing *like* or *organise*. Give students the task of writing down what they think might be the top variations of the given word on their mini-whiteboards. The top 2 with ‘like’ are ‘likely’ and ‘unlikely’, while the top 2 with ‘organise’ are ‘organised’ and ‘organisers’ although ‘reorganise’ and ‘well-organised’ appears later down the list. I first got the idea for this activity from a colleague, Fiona Johnston, and have found it really useful and motivating. Now, I get students to do it on a mini-whiteboard which they can then rub out, rather than on sheets of white paper. I walk into class not saying a word and proceed to write the following on the main board. You’ll work in groups of 3. You will discuss the following topic I will give you. You can interrupt your partner but by writing. Try to avoid very long paragraphs. Don’t make your partners wait too long while you write. As they write, I play some Nina Simone and Michael Buble in the background and walk around correcting their sentences. Works a charm and students often realize how similar this form of communication is to chatrooms and instant messaging, and therefore find it extremely useful. Partners sit back to back. Student A draws a picture on their mini-whiteboard. They then try to explain and describe the picture to their partner who will then proceed to draw it on their own mini-whiteboard. At the end, both hold up their mini-whiteboards for the rest of the class to compare and see how similar (or different) they are. Sometimes, I get my students to draw the layout of their house (great for prepositions of place), sometimes just random shapes and lines, sometimes they draw a pretend snapshot/photo from their photo album (adapted from Danny Norrington-Davies), and sometimes a favourite painting/album cover/item of clothing, etc. One of my favourite ways of teaching writing is simply to get students to write a paragraph (after sufficient brainstorming and deciding on the content of course) and me writing a paragraph with them. We then compare what we have written and look at how our paragraphs differ and what they can do to make their paragraphs better. Take for example a recent IELTS preparation course that I was running. Students were given a topic like ‘Video games are bad for children and should be banned. Do you agree?’ After brainstorming the ‘for’ and ‘against’ arguments to the topic, we decided to write the introduction to the essay. We spent about 4 minutes writing quietly on our mini-whiteboards, and when students were ready, they compared their work with their partners. I then had everyone flipped their boards over (including my own) and we talked about their use of linkers and discourse markers, compared to mine. We found it much more effective than correcting students’ writing over their shoulders or taking home the marking because everyone gets to learn from each other’s trials and errors. 10. Win, Lose or Draw! This can be used as a revision tool. Students have all their previous lexis on cards, they take turns drawing and their partners guess the lexical item. And those are the 10 things that I use my mini-whiteboards for when teaching English. Do you use mini-whiteboards too? Did your school purchase them? How do you use them? Do your colleagues use them too? Do share what you do with these wonderful little things! Nice ideas! I’m going to have to steal some of these! 🙂 I particularly like the silent conversation and the jigsaw reading with pictures. Definitely going to give those a try! Personally I use mini whiteboards a lot in class in to make it more inclusive. I have adopted the “hands down” approach and now use mini whiteboards to check understanding and make sure the whole class is on the same page, as it were. At a glance I know if they’re with me or not. (The article I wrote on this is here: http://tinyurl.com/cjvjjwc). Thanks for the link to your article – love the Hands Down method and looking forward to giving it a go. Bonjour ! I *love* your idea of silent conversation !! and the way you introduced it very theatrically, writing on the board as you entenred the room. It’s an excellent idea, very near the chatroom situation, indeed ! could we accept the *physical* and real use of smileys and faces to add some fun ? Ahah! Thank god it’s not just me then. Ever since I saw them used in ‘mental maths’ activities I’ve addicted. I even had little boards on wheels or table top versions at one point. But I think with the whole tablet craze most things can be done on them probably better, yet most schools are a long way of that being the norm. On wheels? Table top versions? What are they? Please enlighten us, they sound outrageously fun!!! Thanks Chia for your great ideas. Our college recently bought some mini whiteboards and I’m yet to give them a go – will do on Monday now! Many primary schools I visit use these boards. I think they’re brilliant, and this set of activities is nice and comprehensive. I’ll vouch for that. My middle school students used to hold them up in the air and stand on their tiptoes just so I could see their answers. They also got a bit aggressive when their pens ran out in the middle of an answer so make sure you have some spares. Chia I really want some mini-whiteboards now! Where do you buy them? If you can’t find ready made mini-whiteboards, it’s easy to have white paper “plastified” on both sides. They are so much fun to use and there are so many ways to adapt activities to the level and context you are teaching in. Anthony, I’m sure if you google ‘mini whiteboards’, you would find quite a variety being sold. You could also make use of these wonderful rolls of whiteboard paper to create your own whiteboard on any surface. They are brilliant. Check out this website. loved it! particularly the silent activity! Those white boards are also good for the environment! Thanks so much, Ana. Yes, they are indeed great for spelling games and team work… And strangely, students feel a real sense of ownership when they flip those boards over to show the class what they have written. Magic, indeed! OMG! Hi, I can’t believe I found your blog. It was just pure chance that I happened to chance upon your blog because I was looking up on the old channel 5 series Triple 9!! I grew up watching the series and I am a huge huge fan of Sergeant Yeo and of course, YOU! I’m glad to see that you are doing well in London and I really hope you can see this because I’ve been keeping a ear out for your news! oops, too excited. i mean an ‘eye’ out. Absolutely, Phil. Much cheaper than iPads indeed…and probably more environmentally friendly too! Thanks for your link. This is the second link to a mini-whiteboard post (the other was by @TEFLWorldWiki). Maybe we should put all our ideas together and publish one massive blogpost on all our blogsites compiling all our ideas…! What do you consider to be a mini white board? My kids love the portable ones that I get them every year for Christmas because they can use them in the car while we’re on trips. The best part is that they’re designed to actually stay on their laps without a lot of effort on their part. Thanks! I also use them regularly in my classroom as a way to check for understanding and to engage all students. I have gone the econo route. I use a piece of cardstock paper inserted into a sheet protector. Each student keeps one in their binder, so it’s easy for them to access. I have a class set of markers that I use. The kids love using them, and I teach middle school! Following on from reading your Dogme teach-off posts, I’ve come across this… Well, you have convinced me! I’ve ordered a set and am excited about them arriving. I think that’s the best thing about the PLN, always find more things to get excited about in relation to teaching! 🙂 The learning element, of course, goes without saying! I’m absolutely loving your blog, so thanks for putting all out there on t’interweb for us! You can also laminate white (or light-colored) paper to make your own mini whiteboards! Or laminate books, or cardboard, if you want something harder! Hello, chiasuanchong. Actually we have the same ideas of using mini board to teach English in ESL classroo. Fro me i encourage students to use mini blackboard but with chalk, or they can use with markers. This mini board can help them to learn vocabulary, review the previous lessons and especially teacher can check whole class works at the same time not just three ot four students. We can use this kind of board for many different subjects with differents purposes. Students usually call it an Ipad. Wonderful ideas, actually I love these. I have never used mini white boards in my class, but now thinking to give them a try. I really like silent conversations and brainstorming ideas.